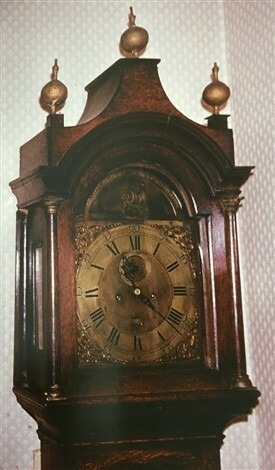 This clock was made by John Gullock in Rochford, probably in the 1780s. It has been in my family since the 1850s, and is known as "John Gullock". It currently lives in Portsmouth. Unfortunately it suffered an indignity in the later part of the 19th century, when my great grandfather moved to a house with very low ceilings. A local carpenter was called in to cut about 12 inches off the bottom of the case, leaving poor old John Gullock looking a bit top heavy. This page was added by Jane Lindsay on 24/01/2017. Hi Trevor, very interesting and we would be pleased to see a photo of your clock. You cannot add photos to a comment - nobody can - but if you send one to me as an email attachment I'll add it to the bottom of the main article. Regards Bob Stephen (RDCA Admin). Thanks to blind luck, I stumbled across a John Gullock clock. Having read this article, I was compelled to bring it back to Canewdon, his son’s former home. If I knew how, I’d post a picture. I am currently researching the Gullock/Gullick family tree and would welcome any information to assist me in my endeavours. Access to any Gullock/Gullick family trees would be much appreciated. Robert Gullock, John's eldest son, married at Canewdon in 1787, and by 1801 he was living in Gravesend. Philip Hoare/Howe Gullock was the third son. The others were John, a stay maker, William, a saddler who moved to London, and Thomas, occupation unknown, who died in 1794, age 21. There was also a daughter Hannah. John senior was born in Southminster in about 1737. His father, Robert, was a tailor, who died when John was about four years old. In 1752 John was apprenticed to Mark Draper at Witham. John Gullock was indeed a Clockmaker in Rochford. Clocks and watches with this name do come up for sale from time to time. It would appear he had two sons: Robert Gullock who lived in Canewdon and was apprenticed to his father until 1790 (no more info. on Robert so he may well have died in that year or moved away?) and then Philip Howe Gullock also apprenticed to his father until 1790. The business trading as ‘John Gullock’ was still in existence in 1848 but by then it is listed as a watchmakers and was owned by Philip Howe Gullock.